I didn't work out yesterday and it shows. Only got to 40% of my goals. 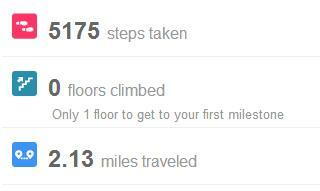 I did update Daily Mile with my fitbit steps from the year, but so far it has not updated my miles for the year - though it shows daily stuff on m profile. Not sure what's up with that. I want to track my miles for the year so I may have to find another place to do it.